Hello Carl, we can offer you accommodation in our new chalet next winter, good rates for early bookings £80 per night person, fully catered including table wines. The chalet is called the nest near les gets and morzine. We have a part week available between 5-11 January at Chalet Porte du Paradis. Our chalet is located right at the centre of the massive, snow-sure Paradiski ski domain (435 km of runs with 70% over 2000 metres), so you get all the charm of a traditional Alpine village alongside some of the best skiing and boarding Europe has to offer. The chalet is just a one minute drive (it’s a five minute walk but we still provide a lift) to the Lonzagne lift in Peisey which takes you to the Vanoise Express linking Les Arcs and La Plagne. If this is of interest or you have any questions please let us know. Our chalet is situated just outside of Vaujany, a small, authentic Alpine village with great amenities such as a swimming pool, bowling, amazing day care, an ice-skating rink and daily animations. We are part of the vast ski area of Alpe d’Huez which is superb for people of all levels of skiing. Our spacious lounge has a large log fire. On the ground floor we have a bar and dining room where James cooks fantastic three course evening meals. The chalet sleeps 19 in 8 en-suite bedrooms of which; 6 double/twin rooms, one triple room and one family suite. There is lots of space for everyone to enjoy their evening as they please. Whether it’s sat in the hot tub watching the sunset, reading a book by the log fire or having a drink in our bar. We have an on-call shuttle service to take to you the village. To avoid any hassle on the day of your arrival we can arrange discounted lift passes to be ready on your arrival. We also assist you with ski hire and private airport transfers. Please, do not hesitate to contact us if you have any questions. #Hideout in the exhilarating mountains of Morzine, France. An hour from Geneva airport but a lifetime away from work! Hideout Hostel’s central location in Morzine makes it perfect for those who want to be in the heart of the action. Just 50 metres from the shops, bars and restaurants, a short walk to the ski lifts and the ski bus stop linking you to the vast Portes du Soleil lift network. Affordable yet stylish, functional en-suite rooms in the heart of Morzine. Choose from twin, double, triple rooms, or if you are on a budget, we also have shared 6, 4 or 2 bed dormitory rooms. •	Airport transfers, we have sourced a reliable and good value door to door transfer service. •	Ski and snowboard delivery to the Hostel, relax in the bar, and not the cramped ski hire shops! •	Lift pass delivery, avoid long queues on the first morning of your holiday! Hi Carl; La Tania- Courchevel We are offering short breaks through our Chalets can offer you a 4 night stay Thur-Sunday ( 4 nights) 3 evening meals wine and beer included for £400pp we also offer return direct transfers Geneva for £100pp book an early flight in ski half first day and late back ski half last day !!! We have our own ski and boot hire ready for your arrival as well as your ski passes all at the best discounted rates. Our chalets offer luxury ensuite accommodation, ski in ski out , yet close to the action in the village, great home cooked food , ample ski storage, boot warmers and out door hot spa areas. We'd be delighted to accommodate you at Mountain Voyages chalet. Food: We offer you a trip around the world in 7 days, with homemade meals that will make you wonder if you are still on a ski trip. Also, different cooked breakfasts, afternoon tea, mouth-watering canapés, wine is also included in this price. Location:85 minutes from Geneva and 7 minutes to the pistes of Portes du Soleil eith direct access to the ski areas of Avoriaz (one of the best ski resorts in Europe, the Best ski destination for families and the Best snowboarding resort in Europe). Connecting 2 countries 12 resorts, 300 pistes and 11 snowparks, 600 km2 of slopes. Outdoor hot tub, private shuttle and owner run…A stay at mountain Voyages is much more than just your average chalet holiday, we have all the little luxuries you'd expect from a ski chalet but what really sets us apart from the rest is our total commitment to your enjoyment. I’m pleased to say we can accommodate you in style in stunning chalet Ferme du Ciel in Samoens in the snow-sure Grand Massif. Luxury at great prices. Contact us with the number of nights required for a quote. Ferme du Ciel is owner run and, standing head and shoulders above your average ski chalet, it is loved by the press. It has recently been featured in places such as The Sunday Telegraph, The Guardian Travel, Grazia magazine, and French design magazine Côte Est. One of the French Alps’ most easily accessed resorts; Samoëns is part of the snow-sure Grand Massif and located only ONE HOUR from Geneva airport. You can be off the plane and enjoying the slopes in under 2hrs! You’ll stay just 5 minutes from the Grand Massif gondola, which offers easy express access to more than 265km of pistes. Samoëns is directly linked to Morillon, Les Carroz and of course, giant Flaine. For more information about Ferme du Ciel, visit our website www.fermeduciel.com, where everything about us, the area and the farm itself is at your disposal. We’d love to have you stay, so please don't hesitate to get in touch. We specialise in Gourmet mini ski breaks and have availability from 12th January 2020. Four nights catered Wed-Sun £6500 Three nights Thurs-Sun £5000. Ski Chalet Mont Blanc is an owner run newly converted French farm and would be a great place for your group. Our stunning luxury Chalet with hot tub has six ensuite bedrooms and large open plan living area with contemporary woodburner and amazing views from the balconies. There is a mezzanine snug with satellite TV, DVD and games. St Gervais is France’s best kept secret and at just over an hour from Geneva and with 440km of piste is the third biggest ski area in France a great place for all skiing abilities, with an excellent ESF ski school. We drive you to a telecabine of your choice within the Evasion Mont Blanc in our 12 seater Land Rover each day, the main Telecabine and town of St Gervais are only 5minutes away. Megeve, Les Contamines, and Combloux are just 10minute drive away. We can also arrange an experienced mountain guide, maybe Ski the famous Vallee Blanche. Delicious home made breakfast including freshly baked bread as well as local bread and croissants, home made jams and marmalades, cereals, yoghurts, fruit and a cooked option each morning. Each evening we offer pre dinner drinks and nibbles and Champagne reception on your first night. Four course evening meal using fresh local ingredients accompanied by our house wines selected by our sommelier. All towels, linen and Moulton Brown toiletries. We would love to welcome you to Chalet Le Pery, a stunning alpine chalet nestled in woodland in its own private grounds with uninterrupted valley and mountain views. It is only a 45 minute drive from Geneva airport and conveniently located close to the resorts of the Grand Massif with heights of 2,500m and 265km of awesome skiing for all levels from beginners to the more advanced. * Double room with en- suite bathroom. * Incl. cleaning & linen. Résidence La Joly’ is located in front of the slopes of the picturesque ski village La Chapelle d’Abondance (France, Portes du Soleil). Portes du Soleil is one of the biggest winter playgrounds in the world, with 12 linked resorts and 680 KMs of slopes. •	In-house ski shop with new rental materials. •	1:15 hours driving from Geneva Airport. We have a great option for you in the Chamonix Valley. If you have more questions, do feel free to get back in contact. Am only too happy to help further as required. Come and experience a catered chalet holiday with Ski Peak in the picturesque resort of Vaujany, linking into Alpe d'huez, 3300m. You won't be disappointed! The price per adult in early Jan is €175 a night for half board to include: Accommodation, breakfast, afternoon tea, daily cleaning and an incredible dinner with fine wines. Our chalet is just 200 yards away from the lift station, leisure centres (& crèche) and hire shop (discounted rates). A very popular choice for couples, older groups and also families with young children due to its relaxed and safe environment. Vaujany itself is a very quaint little village with incredibly modern facilities. The chalet now boasts a state of the art outdoor HOT TUB, brand new SAUNA and fast WiFi! The journey time from Grenoble is only 1 hour via car (taxi is €240) and 1.5 hours via our private coach (€36pp). Lyon is 1.5 hours via car (taxi cost €315). Bens bus is a brilliant alternative transfer service, from €48.50 return. We are a family owned company in our 30th season. Your holiday is financially protected by our ABTOT bond making your money 100% safe. GREAT SERVICE- Small company, relaxed atmosphere and friendly staff. TOP RESORT – Vaujany, Alpe d’Huez. 3330m down to 1100m with great snow fall throughout the season and 300 days of sun. FANTASTIC LOCATION- Charming village. The chalet is just meters from the lifts and leisure centre. Thank you for your enquire. Half board accommodation + Sofia airport transfers+ SPA with Indoor pool. We are very close to ski lift and are ski, 8-9 min walk , or 2 min by our ski bus. Catered week, 7 nights, adult stay, January, £ 290 person/ week. 3. Accommodation in double/ twin, triple room or one bedroom apartment. 9 Free access to our own Spa floor with heated indoor swimming pool, sauna and Jacuzzi. 10. Free Internet and Satellite TV. In house facilities: Bar,Garden, Massage room , Games,others. To confirm booking a 30% advance deposit is required. 20 % to receive one month before arrival . Balance can be paid while at the chalet, by card,bank transfer or cash, Levs or any major currency. Quality Ski hire & Ski lessons at local prices. Purchase of ski passes at list price , to wait for you at arrival, no need to que. Trips and activities, other services as requested. Our Chalet L’Etoile des Neiges ,located in the popular ski resort of Alpe d ‘Huez is available for the week commencing 4th January and 11th January 2019. The Chalet , Grand Etoile, can sleep up to 12 guests, over 2 floors and also has its own Jacuzzi / Sauna room within the Chalet. The website price for Sole Occupancy in Grand Etoile is £5489. Our Chalet is situated right in the heart of the old town, only 120m from 3 ski lifts and within just 2 minutes walk from a great selection of restaurants and bars. Sport 2000’s ‘Ze Shop’ is directly opposite for your ski and snowboard hire, where we can offer 20 - 30% discount on the shop price. If you have any questions or wish to book, please email info@rushadventures.co.uk or call us on 0121 288 6131. Many thanks for your email enquiry. We can offer you 3 gorgeous chalets in the stunning Chamonix Mt Blanc valley. Chamonix is ideally located just one hour from Geneva. Our high altitude ski area ensures snow sure skiing with lots of great on and off piste plus some of the best nightlife in the Alps. Ski passes, equipment hire all arrange to arrive at the chalets for you. Plus help in arranging any ski lessons you may require. Our Chalet in the French Pyrenees is available on a Catered or Self-Catered basis in January next year. We're happy to be flexible on dates and length of stay. So for simplicity we could offer a half-board nightly rate of 75 € per person based on 2 people sharing one of our spacious en-suite bedrooms. We'd be happy to include the Airport Transfers for that rate too. We also offer lifts each morning and afternoon to the ski stations although you might like to take the opportunity to wander around our wonderful 19th century town and sample the atmosphere. We could offer La Vieille Ferme de la Moussiere: a truly unique farmhouse/chalet steeped in history and charm. The chalet enjoys a village centre location; with a range of shops, bars and excellent restaurants within easy walking distance. Our location right in the heart of the Portes du Soleil ski area means that over 650km of varied ski-pistes; plus excellent off-piste terrain can be reached within 10 minutes. 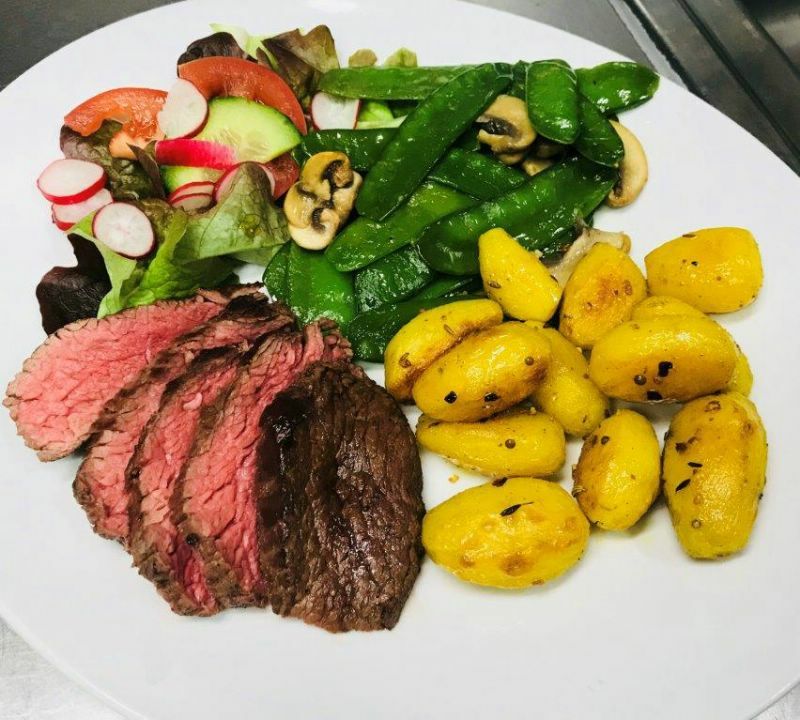 The chalet can be booked on a catered or self-catered basis, or new for 2020 we are offering an optional meal-delivery service. Breakfasts / lunches / dinners can be chosen and booked online, freshly made and delivered daily to the chalet as and when you want them. Save yourselves the hassle of cooking, but benefit from cheaper prices and more flexibility than the typical catered chalet package. We can also organise piste runs, airport transfers, ski passes, equipment and lessons if required. I hope we can help. Please contact us if you would like a quote for your group.